Nifelheim (1990-present) is a Black Metal band from Dals Langed, Sweden. he history of Nifelheim is a short and simple one. They started in 1990 with original members (known only by their stage-names), Hellbutcher (vocals), Demon (drums) and Tyrant (all guitar), with the intention of becoming the hardest and most violent band ever to "fight the war against Christianity" (as they claim). Shortly after their founding, guitarist Morbid Slaughter joined. Over the decade that followed this group of leather and spike clad multi-instrument musicians would release a set of albums, improving little over their basic double peddling hyper speed black metal of mediocre to bad production on each. Considering each played the other's instruments often for the first time (and probably wore each other's clothes too [ed. ]), it wasn't any wonder why the quality wasn't better? The line-up has been surprisingly stable during their existence. The first change was John Zweetsloot taking over as a session guitarist from Morbid Slaughter in 1994. 1995 would see Hellbutcher leave vocals for drums and Demon take over one of the guitar slots, while new member Goat took over on vocals. Hellbutcher would be back on vocals by 1999 when Devastator took over on drums; Goat, it appears was ousted. They debuted in 1993 with the 4 track EP, Unholy Death., their self-titled full length album debut would follow in 1994, as well as appearing on the soundtrack to some movie named 'Gummo', and the compilation Headbangers Against Disco with the track Witches Sabbath (a Volcano cover). Devil's Force followed in 1997, with Servants Of Darkness (2000) representing their next. 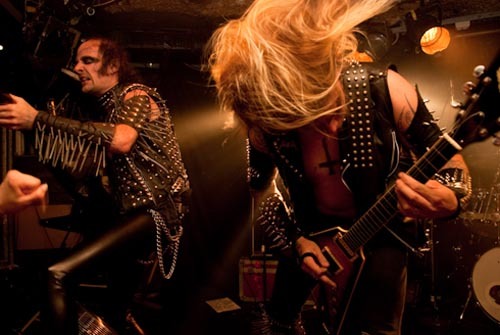 After a documentary about heavy metal fans which aired in Sweden in 1998, Tyrant and Hellbutcher were given the nickname "Bröderna Hårdrock" which translates to 'The heavy metal Brothers' in English. In 1998, Nifelheim contributed Die in Fire to the Bathory tribute album In Conspiracy with Satan - A Tribute to Bathory. In 2001, the band played their first concert as headliner at the 2heavy4you festival in Sweden, followed by other concerts in Europe. 2014 - Satanatas (Vinyl EP).